Originally from Michigan, I received an MA in Comparative Literature from the University of Michigan. A DAAD scholarship took me to Germany in 1968, where I remained to obtain a medical degree from the Johann Wolfgang Goethe-Universität and my qualification as a psychoanalyst at the Sigmund Freud-Institut in Frankfurt – a constituent member of the DPV (German Psychoanalytic Association) and the IPA (International Psychoanalytic Association). I worked abroad as an analyst for over 30 years, at the same time pursuing postgraduate training with London Kleinians. Due to my expertise in this area I was recruited to lead ongoing supervision groups in Frankfurt, Hamburg, and Berlin. Publications include articles in The International Journal of Psychoanalysis, Psychoanalytic Inquiry, Psychoanalytic Quarterly, Die Psyche, Die Zeitschrift für Psychoanalytische Theorie und Praxis. I have been a DPV training and supervising analyst since 1994. In 2008 I moved my practice to San Rafael, California. 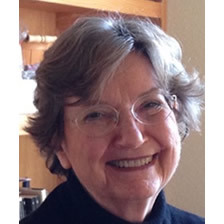 Licensed in California as a Research Psychoanalyst, I belong to and am certified by APsaA (American Psychoanalytic Association) and am a training and supervising analyst at SFCP (San Francisco Center for Psychoanalysis). In my clinical practrice I treat adults, offering psychoanalysis, psychotherapy, couples therapy, diagnostic consultations and short-term counseling. I can work in German as well as English. Health professionals might also be interested in what I can offer them: I am a group analyst with extensive training and experience in team superivisions and Balint groups, as well as individual and group supervision.